One major phase of the cycling, planning and eco-disaster of the Bloor/Yorkvile rebuild is just about over – the road is now smoothly paved. But apart from the wisdom of trying to repair and renew the great number of underground utilities ahead of repaving, it all remains a travesty and squandered set of opportunities in this greenhouse century. It seems that all we will be getting for a bike lane is this temporary space marked off for the application of some sharrows – when this part of Bloor is about the most logical place in Southern Ontario for a bike lane!, analyzed as best in old TO as far back as 1992. That planners and politicians could once again fail to make room for bikes on yet another wide street of Caronto should be a firing offence. Spadina wasn’t wide enough for bike lanes 15 years ago, though it was later in the planning stages when we began to ask for them. That neglect did not bring any change to St. Clair Ave., and that failure was repeated again with Bloor, and so we now are committing ourselves and future generations to less safe biking and avoiding the multiple wins of increased bike use. Yes, technically some staff and politicians are correct in that bike lanes could be added here – the on-street parking is taken away by merchant consent, and the road could be repainted. But to repaint the road here for bike safety means removing a lane of the car travel either way, as the morons have rebuilt the road a simple metre too narrow for 2 bike lanes and four car travel lanes, with the current standards. And given that this is Caronto, and how feeble even some of the allegedly pro-bike politicians like Mr. Vaughan actually are when it comes to real change on the streets for continuity in bike lanes, it is most unlikely that we will be able to muster the resolve to boot off much of this traffic, despite the subway. To be quite clear: some of we bike advocates may be “unreasonable” in our expectations, but in this instance we have been far far keener on providing the room for bike lanes by smart design, and not by removing travel lanes, as many people do drive still, and vehicles are useful for many of us, though we really want to provide better options. Yes, we have sharrows, and they can be useful in some places. They are slightly better than zilch, but it is a weak substitute for appropriate planning, will and Environmental Assessment that provides real safety for an entire class of vulnerable road users. The lane remains too narrow for comfort, the City staff have said publicly that they really prefer a wider curb lane width for sharrows now, and besides, there remains that rather ugly killing of a cyclist, Mr. Sheppard, who had the temerity to get in front of a car on Bloor, over a year ago. (Please view the surveillance video of the initial spark posted on Youtube, and consider if there is a disparity between the words used by the Crown etc. to describe what happened, and what the video shows). In terms of dehiring staff and politicians that might have culpability for this travesty, on the City level, the only politician to vote against this $25-now-$30M Bloor project, was Mr. David Shiner. And since money has been no object with the increased costs, we need to consider how much it would cost to rebuild the curb segments with wider space for our safety, as unpopular as it would certainly be. And have a permanent memorial for Mr. Sheppard where he fell, perhaps in pink granite. The City has an ongoing liability for bike safety here, and by failing to provide safe passage on the roads, it sets up more conflict with cyclists fearing for their lives and riding on the now-wider sidewalks. And the court documents showed they cared more for the well-being of car doors opening into planters than of cyclists. However, cyclists are taking to the smooth pavement again, and we must ensure that we all assert our rights to use this road even though our governments have been dismal failures again in providing for our safety. Coming out of a major mayors candidates meeting last night – of the moving vehicles between Church and Jarvis, two were cars, and 7 were bicycles. We are the future. If we get snow, can the City plow it out of indents? The parked cars on St. George St. below aren’t just parked in the bike lane, (with their correct parking spaces to the right of the bike lane in an indented bay,) they’re so far out they’re constraining the travel lane. And there is no bike lane, and cyclists have to take the lane to have a bit of safety. Councillor Vaughan’s championing of the recent Bloor Visioning OPA – without seeing bike safety as any issue worth being concerned about – and thus approving both the status quo of risk but increasing!! risks with the indented parking bays while avoiding warnings of increased dangers to cyclists by increasing the constrained cycling conditions we face is irresponsible. I also feel that the various Resident’s Association’s in the area have some responsibility and thus liability for making the risk both ongoing and in wintertime, making it worse. Roncesvalles has also ignored these design issues, which have been raised before, with examples on College and Spadina. While this year, year-round cyclists have been very lucky with little snow, and the odds of climate change will mean more of this lightness, we also will still have some snow and judging by years of exposure to this inability to plow out indents, cyclists will be at risk from bad design and civic inability to do basic operations. Yes, the snow has to go somewhere – but the degree of encroachment shown here is excessive, and presents too much unnecessary risk to cyclists. Kyle Rae promised to put on bike lanes on Bloor in his last election campaign, and it was somewhat reinforced by a motion of Council to greatly upgrade the bike safety conditions on Bloor in Yorkville as part of that reconstruction. But sadly, all we’re getting are sharrows. While sharrows do have some real potential for improving our city’s biking, they’re so inferior when put beside what’s often done in Europe, and what could have been done here on Bloor in Yorkville. The true tragedy is that there is room on the new road for bike lanes, just they’re being paved shut – in granite – with wasted space between the planters and the curb of .8M – which bike-friendly design would reclaim for bike lanes, as the road is just one lousy metre too narrow for good bike lanes of 1.5M and two travel lanes of 3M (Total is 15M, the new road is 14M). Elsewhere in the City, this space between planter/curb is far less eg. 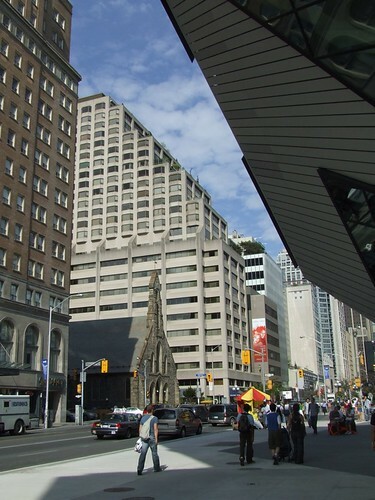 Wellesley near Church, and in the Annex, and the entries to the subway at King and University are right at the curb. So as Kyle Rae announces that he’s not going to run again – details are here http://www.thestar.com/news/gta/article/738176–rae-takes-aim-at-other-politicians?bn=1 – he shouldn’t be thinking he’s got a great legacy of providing for bikes, as his tenure started in 1991 – a bit before that Marshall Macklin Monaghan report that nodded to wide Bloor from Broadview over to Spadina as the #1 best spot in the old core for east-west bike lanes. And the follow-up option and compromise of using Wellesley St. for an east-west bike lane is in itself badly compromised in design, and execution, where it became apparent after a year of vexing by Hamish and an FOI that the City has installed an irregular bike lane that has a true danger spot on the eastbound bike lane where it curves east of Jarvis St., and that this lack of safety is caused by the City not knowing what the true dimension of the road actually is (12.5M on paper, 12.0M in reality). So like Mr. Miller’s legacy, the legacy of Kyle Rae can’t be seen as positive, but instead far more of a set of lost opportunities marred by the horrific death of an admittedly not poster-child cyclist that if the City had acted 18 years ago to provide bike safety with bike lanes parallel to the subway, we wouldn’t have had a pair of tragedies. While the road-ripping has seemed paused for Christmas, with a spurt of tree-destroying despite the desire for more consumption of the season, it’s a shame that our leaders can’t pause this project to give cyclists and our climate a real nice Christmas present of extra space for bike lanes – some year – with pushing back that curb for the remnant two-thirds of the project. This includes Mr. Rae and Mr. Miller, who need to truly "green" their legacy. Wayne Scott has been promoting better biking far beyond Bloor St., and has recently been gaining some press on longer standing efforts to bring safe working conditions for anyone that is biking as part of their work. This isn’t as many people as we might hope for or think. Most urban cyclists fall outside this category. We use our bikes in utilitarian ways, often to get to work, hopefully in one piece and alive. Let’s hope Scott’s efforts work — one can be just a tad cynical about logic, atmospheric crises, peak oil, and urban and personal health benefits being ignored by our City’s refusal to put in good Bloor bike lanes – where many of us still wish to ride, and are riding. One small area of the City can feel like a different world sometimes. This summer, Bloor St. through Yorkville was especially hellish and harsh to bike through, complete with a sign of "cyclists dismount", showing that while in some bike-supportive cities, bike riders get the green wave, but in Caronto, we get an orange finger. And meanwhile, with a parallel route, Wellesley Ave., some roadworks brought a much more accepting of bikes signage, embracing the concept that the public highway is a shared highway. Maybe we should have some streets with signs that say "Car drivers must get out and push! ", or in this greenhouse gas century, make it a prerequisite of getting any driving privileges, just to make sure that folks understand how heavy those vehicles can be. And for this disparity in attitudes, chalk this up to just another normal anomaly within Caronto – our official bodies etc. don’t seem to be up for accountability, criticism, or otherwise challenging these double standards. Usually, drains are the low point to drain water, a Civics 001 kinda lesson. But at Bloor and Bay, where we are supposed to ride in the gutter, we’ve been having this degree of ponding, perhaps as a water feature to help "green" this project, which is also removing the bike parking in this vicinity. But after showing this picture at a few places in City Wall, there was a bit of drilling and digging in the general area on Monday Nov. 16th. Perhaps the City is acting to provide drainage? Let’s hope so – it’s not just dangerous and bad for bikes, it’s so severe pedestrians can also get soaked. Bloor Corridor Visioning Study – Now Online. The Bloor Corridor Visioning Study – Avenue Road to Bathurst Street is now online. It should come as no surprise that no great improvement was “visioned” for cycling infrastructure. Included are two mentions that there will be added bike parking. Most of the Annex’s bike parking spaces are usually filled in the summer, so this is welcome news. It comes as no surprise that there is no plan for any addition of bike lanes or even sharrows. There is a mention of adhering to the bike plan. This means that they’ve managed to adhere to the current plan of doing nothing on Bloor. Bravo, noble planners! I’d ask for an encore, but I’m in that minority of people who cares more about climate change than parking spaces. The disappointment that comes from this study should come as no surprise. Councillor Adam Vaughan was defiant against the overwhelming support for Bloor bike lanes at the visioning meeting I attended. It was clear from the get go that he wouldn’t even consider bike lanes. This anti-bike slant goes so far as highlighting one of the few anti-bike notes put up during a brainstorming session (see page 31 of the report). It’s a shame that someone who shows no interest in improving cycling conditions in Toronto is being talked about as a possible candidate to be our next mayor. The City moves, and yet it stays stuck! Along with the slagging of the City by the ECO, there was a PWIC meeting on the same Tuesday that had Bloor St. issues on the table from the Toronto Cycling Advisory Committee. It’s good that the TCAC has sent up some official flares about this, it did get things on the Agenda, but overall, it’s still too tame and inadequate to go along with a large mistake being made in this greenhouse century. I’d put forward a call – fairly clear – to defer or rescind the approvals for this project, but Nope, no movement. This is galling, as the current as-being-built curb-to-curb width on Bloor is only 14m, and all we need for bike lanes without harming the two traffic lanes is one extra metre which is readily available by shrinking the .8m wide splash zone between the new planters and the curb. So it’s really really easy to make sure we do have the ready and easy capacity for putting in bike lanes through this stretch. But nope – progressives and conservatives are united in their dumbness and inability to truly provide for bikes in this important road. On the upside, bringing down pictures of serious road problems on Bloor near Bay, to show why the right side suicide epithet is applicable, does provide some results. One large gouge was fairly quickly filled in by the City, and the large Water Features of this BST are now marked with a cone. Relatively speaking, this is progress, but by some standards, including international ones, its pretty pathetic right? Safe rides, thanks folks, and it really helps us and this advocate, if we don’t ride on the sidewalks at the same time another cyclist rides towards me on Bloor in the opposing direction. The rebuild of Bloor St. in Yorkville is in the mainstream news today with some of the merchants of Bloor seeking a judicial review of the project in Divisional Court by lawyer Clayton Ruby. One major point of contention is the lack of an EA, the same point that has been raised with the ECO office by Takethetooker and Bells on Bloor in late July, and vexed about earlier by Hamish. There’s a compilation of the coverage on Spacing . While Barber’s column is brutal, and brutally funny, its effect is negate the complaint about the lack of an EA, which is wrong. The SUN article has some excellent quotes by Mr. Ruby on the lack of planning and "EA-vasion." Takethetooker is powered by	WordPress 3.2.1 and delivered to you in 0.315 seconds using 22 queries.